Spitfire announces the opening of its Drive, an online store that allows you to order instrument bundles. 8DIO is about to release Cage, its mega orchestral effect sample library for Kontakt. Three dates have been scheduled for the full release. 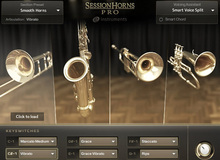 Spitfire adds to its range of orchestral instrument sound libraries the new Low Brass collection for Kontakt. Vienna Symphonic Library offers a 30% rebate off all its Standard Vienna Winds sound libraries this month. EastWest is celebrating their 25th Anniversary with a Silver edition for two of its Hollywood libraries and special offers.